HomeSupport legislation for language opportunity in Massachusetts! 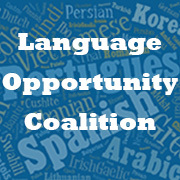 Support legislation for language opportunity in Massachusetts! “An Act relative to Language Opportunity for Our Kids (LOOK)” (HD2211/SD743), filed by Senator Sal DiDomenico and Representative Jeff Sanchez. We now believe we can gather the support we need to be successful this upcoming legislative session. However, we need your help! We want to ensure that as many State Senators and State Representatives as possible sign on to these bills as co-sponsors. The deadline for co-sponsorship is Friday, January 30th, 2015. We are asking you to make two phone calls or send two emails TODAY in support of these bills.